A soft skill is essentially a general ‘non specific’ skill that all employers would want to see on a CV – but not every job seeker realises this and only focuses on hard skills. How does a hard skill compare to a soft skill? A hard skill is a specific skill that would be requested on the job advert – like operating machinery or knowledge of Microsoft Excel. These hard skills are mandatory and you wouldn’t be successful if you applied without having these skills. A common mistake a job seeker makes when writing a CV is to miss out these important soft skills, and even though an employer has not specifically requested them, it’s the candidate’s job to ensure they are highlighted. Not all of the below soft skills will apply to your chosen career, so hand pick which ones you feel you should better showcase within your CV for maximum effect. An employer will always want to hire a candidate that can work great under pressure. There will always come a time when disaster strikes at work – the system goes down, the internet gets cut off, a customer is screaming at you, you’re running late for a deadline, and so on. No matter what gets thrown at you, the employer wants to know from reading your application that you will be able to handle it. Writing a CV that clearly indicates you are able to beat pressure with a stick is going to make a good first impression. No matter how many skills and qualifications you have, it doesn’t prove that you are a tough cookie in the work place, and can roll with the punches. There are not many careers that don’t require some kind of communication – either between customer, co-worker or both. The role you apply for may require you to have strong verbal or written communication skills, and your CV needs to highlight examples of this. Focus upon what the employer would deem to be important, and let them know that you have what they’re looking for by providing examples of your great communication skills. This could be contracts you’ve negotiated, a high sales volume, or examples of articles you’ve written. The hiring manager will want to read a CV and build up an impression in their mind of the candidate. In some roles you would be required to be very tenacious, resilient, open to change, flexible, and willing to take on anything to help the customer and the company. This is what the hiring manager will want to see in your CV. An employee that struggles to handle a difficult situation, and is quite rigid and stuck in their ways, is not going to be an easy one to manage. As a business moves forward through good and bad times, changes will often occur. It could be a structural change, redundancies, department transfers, branch re-locations, change in job descriptions, taking on more responsibility, and so on. All of which would need an employee to take on board and run with it, with minimal fuss and a desire to help everything go smoothly and in line with the company’s goals and aspirations. An employer wants to see that you are able to make good and fast decisions on a daily basis. They don’t want to hire someone and spend a lot of time micro managing their workload. All the training in the world cannot provide someone with common sense, which is a vital part of making decisions in the work place. Sometimes those decisions may only have a small effect on the business, but that doesn’t mean to say that things can turn sour very quickly if the wrong decisions are being made consistently. If you are applying for a management or supervisory position, then this soft skill needs to be demonstrated throughout your CV. This would be an extremely important soft skill to have for any role, and one which will be high up on an employer’s list. Being able to manage your time effectively will be crucial to completing a successful working day – and for obvious reasons. To demonstrate that you have this soft skill in abundance, you could show how you managed your time efficiently in the past through your work history. Explain how you used an online or written diary, a database or calendar to plan your events, meetings, or customer interaction. Every employer wants their employees to be self motivated to complete their daily tasks, and to feel a sense of reward and satisfaction from the job. Obviously you have the same desire, and whilst being paid a nice salary and having a company car is great, if you don’t actually enjoy what you do and struggle to find the motivation; it won’t really be worth it in the end. To show the employer that you are self motivated, passionate and dedicated to the role and the business, use your commercial awareness to map out your CV. Using the right keywords and technical jargon will make it clear to the employer that you know the business and are passionate about the industry. Whilst some roles require more teamwork than others, you will always have to interact with other co-workers and departments at some time or another. Even working alongside just one other person will require you to be a great team player. For a role that is clearly all about working as a team, you need to write a CV that shows an employer how you interact with other co-workers, providing examples of successful projects. There’s no ‘I’ in ‘team’, so don’t write a CV that boasts how great your performance was that carried the team to success, and if it weren’t for you, it would have failed miserably. A great team player is selfless, and doesn’t care about their own performance and only that of the teams, and the importance of achieving the desired goal. The above CV example works really well because the candidate SHOWS the employer they have the skills using real-life examples, rather than just listing off the desirable traits. 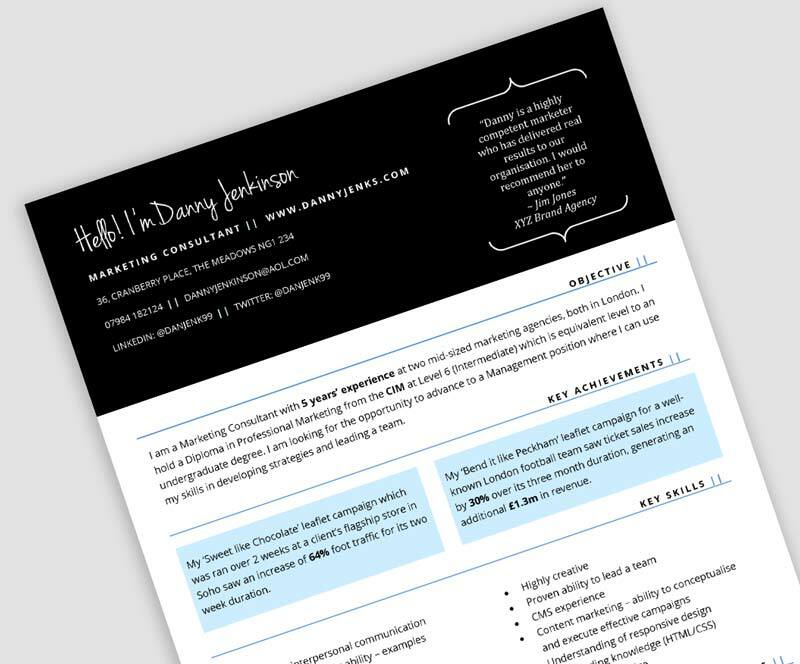 This example can be found on the CV Template Master website and is free to download. Click here. If you are applying for a management position then you entire CV needs to demonstrate your leadership qualities. If you haven’t had any prior management experience and you’re attempting to climb up the ladder, then you can still write a CV that shows an employer how you’ve been working your way up to a leadership role, and all the additional responsibility you’ve handled up until this point. Simply listing all your previous management positions is not going to be a large enough indicator to the employer of your leadership skills, and what you must do is also provide examples of performance. By providing actual numbers and figures, as well as scenarios and explanation of your leadership skills, you are giving the employer a better understanding of how you manage a team and lead. There is no such thing as a perfect job, and no matter what you do and how much you love your job, there will always be something that goes wrong from time to time. And when something does go wrong, the employer wants to have confidence in your ability to solve the issue and move forward. You could demonstrate this soft skill on your CV by providing examples from the past of when you solved a large problem and saved the day. This could be anything from an internal issue to a customer complaint.